Who of us today do not use the public cloud either personally or professionally? I can honestly say that for the past 8-10 years I have had files out on the public cloud in some form or fashion and worked for and with businesses that are making use of the public cloud for as long or longer. Cloud storage has totally changed the dynamics of how data is stored and accessed. 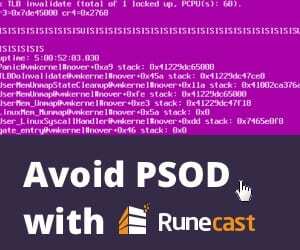 It also provides us with tremendous flexibility with our data and alleviates some of the worries that were associated with files when they were simply housed in local storage. If you have your files all stored in either your Google Drive or Microsoft One Drive, they are automatically synced to public cloud storage. If a local hard drive fails, you still have your data. However, this now very important reliance on public cloud underscores one of the necessary evils of IT infrastructure and data preservation – backups. 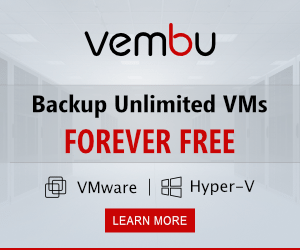 The most elementary, traditional, and necessary IT process is the backup process itself which protects data and allows that data to be restored. Storing data in the public cloud has created a problem of sorts for traditional backup methods. In the public cloud, you don’t control the physical infrastructure so how do you get to your data to back it up? Additionally, it is key with any backup solution to store the backups separately from the data being backed up. How can cloud resources be protected in this way? Let’s take a look at three of the top vendors for protecting both Google’s G Suite and Microsoft’s Office 365 public cloud environments. They are Backupify, Spanning, and Spinbackup. These intelligent cloud-to-cloud backup solutions each provide protection for data stored in the public cloud. How do they protect your data? How do they compare? Which solution provides the best value in features/price? 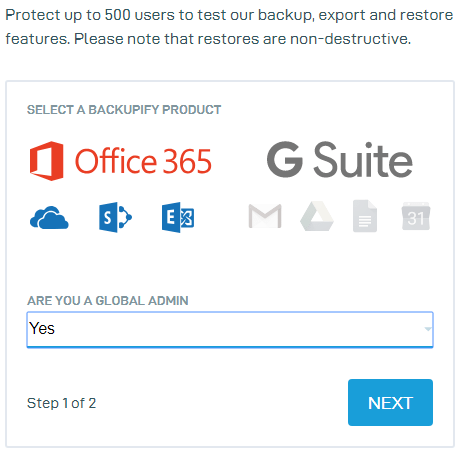 We will look at Choosing the Best Office 365 Backup Solution along with the ease of getting each solution configured, UI, options, and also look at backup/restore operations connected to Microsoft Office 365. 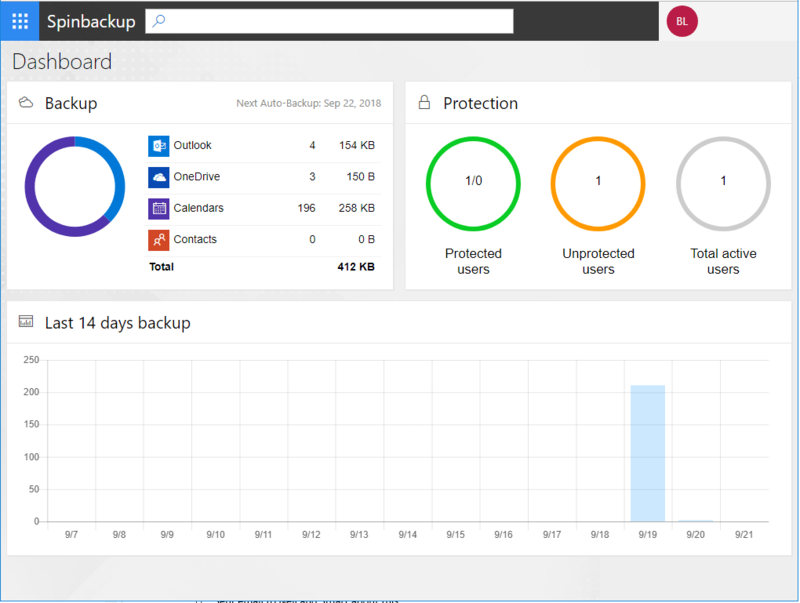 We will take a look at several aspects of each Office 365 backup solution including setup and configuration, UI, backup and restore operations, options, and price. 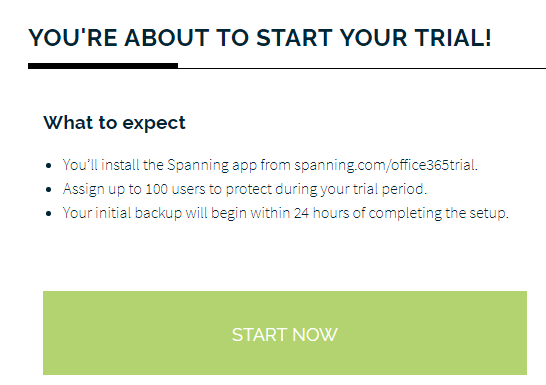 For Backupify, Spanning, and Spinbackup, each vendor has trial versions that allow you to connect to an existing Office 365 subscription. This allows you to try out the feature sets before purchasing the service. 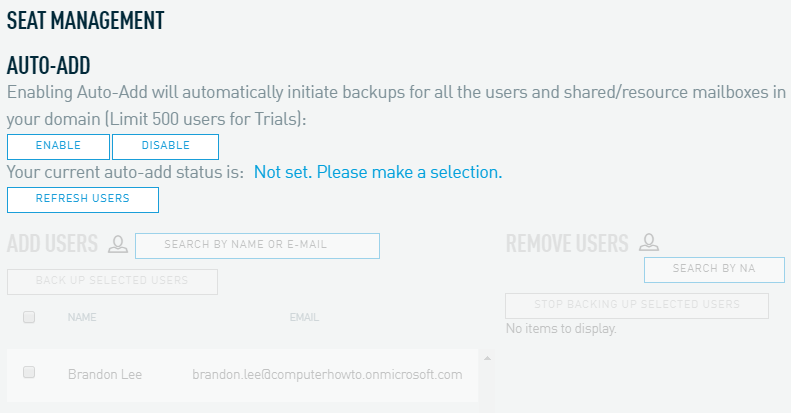 You can also try out multiple backup services on a single Office 365 subscription environment at the same time if you want as I did in this trial of the three products tested. The length of the trial terms for each backup solution are as follows. All three vendors provide easy to get to sign up pages for the trial versions as linked to above. 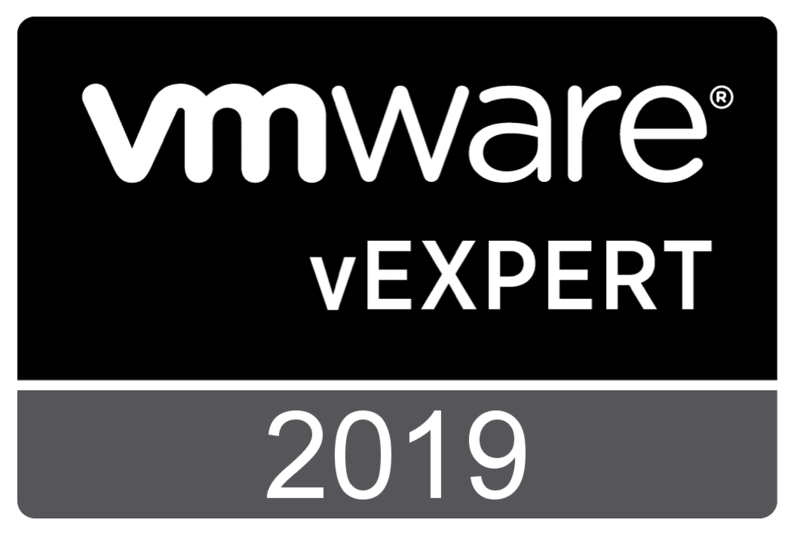 I will walk through this with each below, but for the most part it simply involves connecting their service with your Office 365 environment and granting access permissions. After visiting the trial link on the Backupify website, the process to get up and running is fairly straightforward. The first step on the Backupify site is choosing the service you want to trial – Office 365 or G Suite. 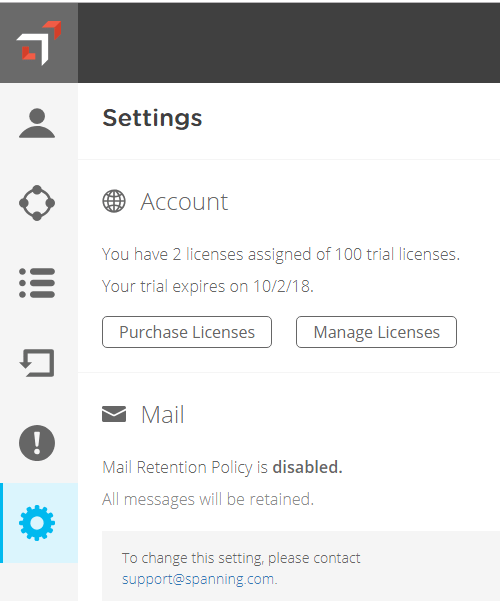 After submitting your email address and password configuration you will be prompted to login to your trial account with Backupify. 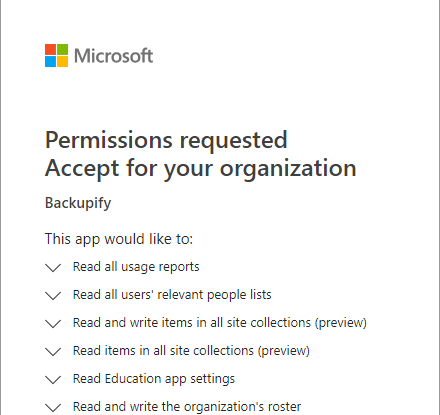 With any of the backup solution services, you will be prompted for permissions to access the environment as you see below with the Backupify service. 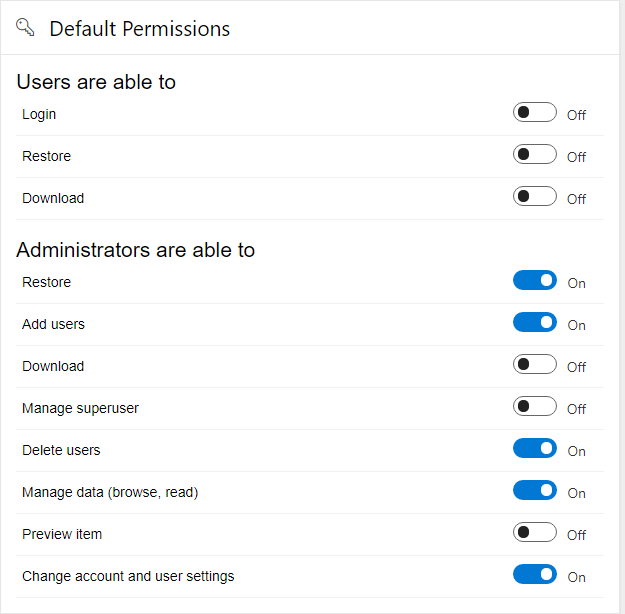 You will need to allow the permissions request for successfully connecting the service to your Office 365 environment. 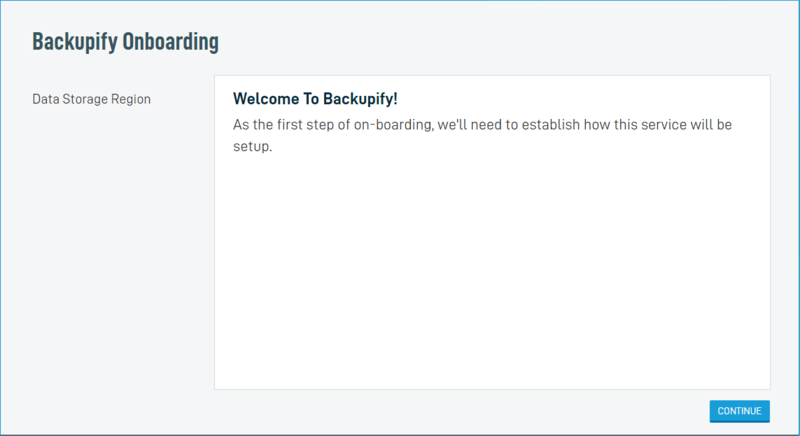 This begins what Backupify calls the Onboarding process which is essentially a setup wizard that allows you to choose your data storage region. 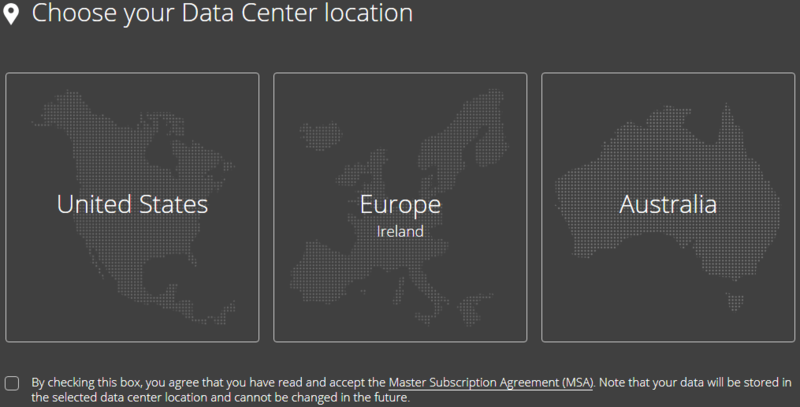 An important note here about the data store region is that you can’t change this once it is configured. So, make doubly sure where you want to store your data for Office 365 backups. Once the data storage region is selected, you will get the All Done notification. One of the first settings to note in Backupify is the ability to Auto-Add users from Office 365. This setting would come in handy to make sure you are protecting any users that are added to the Office 365 environment. After confirming, the auto-add features, new users are automatically protected in Backupify as they are added in the Office 365 environment. I found the Backupify UI to be fairly uncluttered and easy to navigate around in even without being familiar with the product. The interface with Backupify is fairly vanilla. However, “vanilla” is not a bad thing if the product works, and it does. 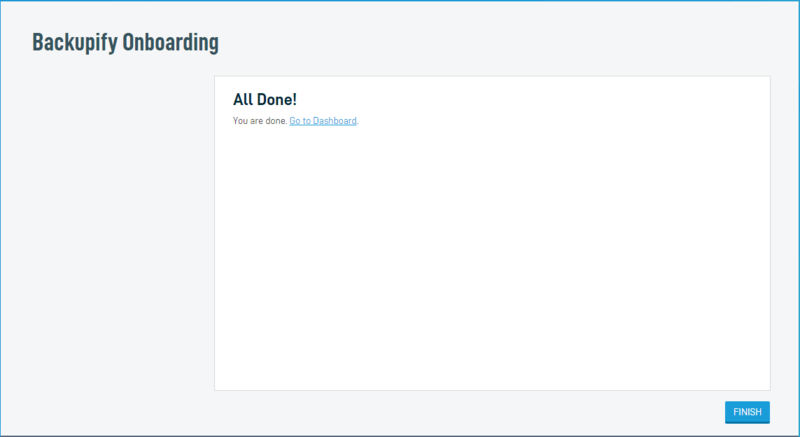 The UI with Backupify works like a fairly classic menu-driven website where everything is intuitively laid out. With Backupify, the top menus display the various Office 365 applications and the menu directly underneath allows working with users, search, exports, and restores. 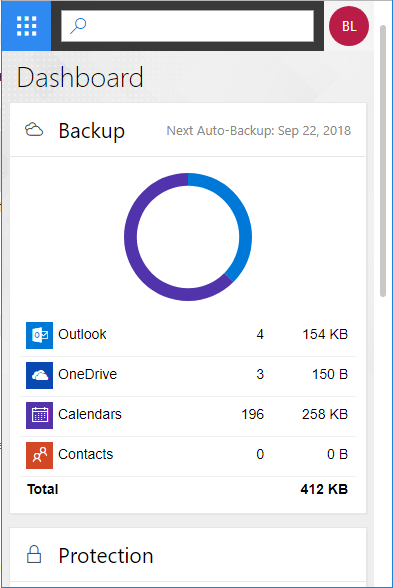 Using OneDrive as an example for a user, you can see below, you can perform ad-hoc backups, restores, or export files from backups. 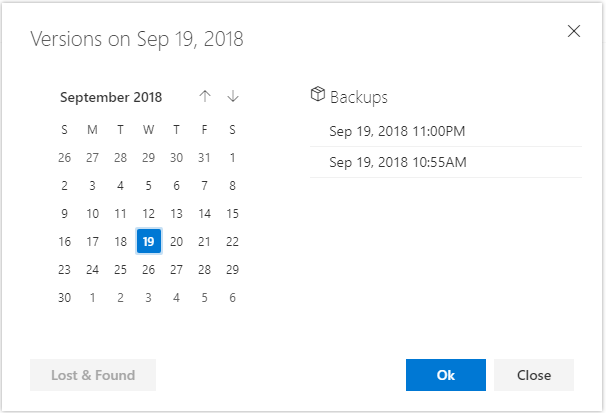 The Snapshot dropdown menu displays the listing of backup snapshot times to choose from. Backupify’s UI is mobile responsive as you can see below. Backupify allows searching for specific files that may be found across or in backups and restore these from the search screen. 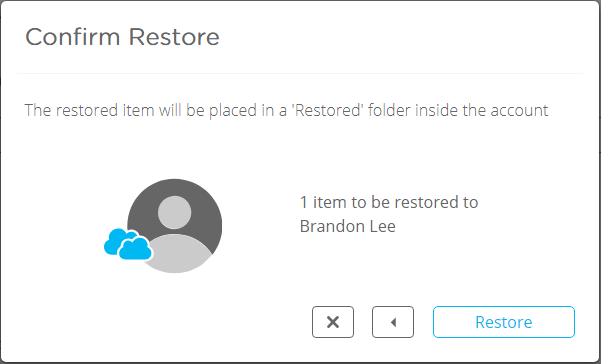 Restoring files can be done to the same user account the files were backed up from as well as you can select a different user account as a target for the restore operation. 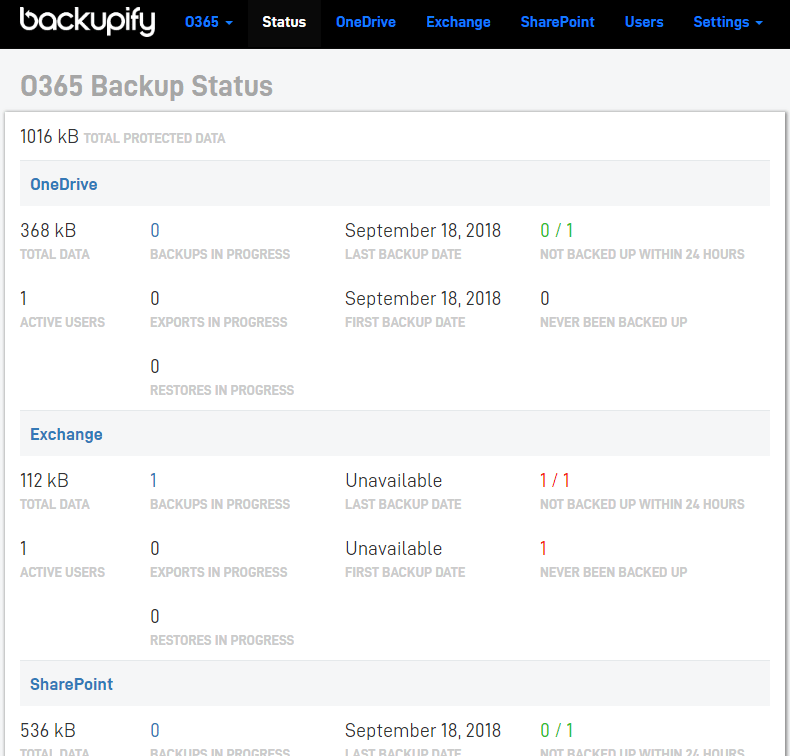 Backupify’s Status screen is a dashboard of sorts that allows seeing current statistics of backups which helps to identify potential issues across the environment with Office 365 data protection. The only thing I will mention here is while the information is great, the interface is a bit clunky and not presented that well. 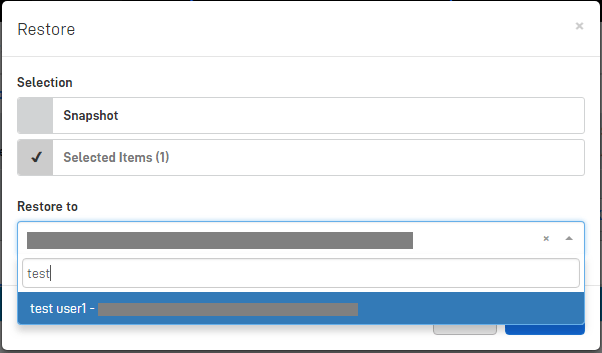 Under the Settings menu you can manage administrators, configure reporting and choose Advanced Settings. Under the Advanced Setting menu, you can set the Retention period and the Maximum snapshot age in days if you choose Custom Retention period. The Backupify solution worked really well and was able to do what it was expected to do – perform backups and restores. Additionally, the search feature to search for items allows quickly finding items for restoring. Restores can be performed granularly or in bulk via an entire snapshot restore. Additionally, the retention settings allow granular control on how long data is kept. Another player in the Office 365 backup space is Spanning. 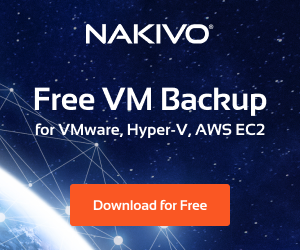 They are described as “enterprise class, automated backup and recovery that you can trust for Office 365 Mail, Calendar, OneDrive, and SharePoint. Some of the self-described features of Spanning include the following. Automated – Backups are daily and automated. New content is discovered and backed up. Point-in-time restore – You can choose the point-in-time that you want to restore based on the snapshot and versions of your data. Granular, search-based restore – Items can be found to restore by searching in the Spanning console which makes restoring files much easier. Cross-user restore – Data can be restored into a different account than the account where the data was backed up. Activity reporting – Activity is captured and reported for auditing and accounting purposes of user actions which helps to round out the overall security posture. Mobile Access – Spanning is mobile device friendly. 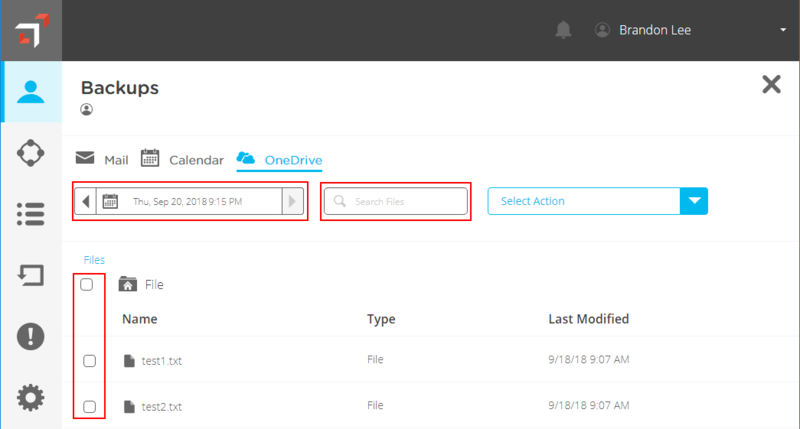 End user self-service – Users can be allowed to find and restore their own lost or corrupt files, folders and data in the various Office 365 applications. First, let’s take a look at the ease of configuring the Spanning Office 365 backup solution. The setup and configuration process with the Spanning solution was similarly straightforward with the Backupify offering. The spanning UI is similar to the Backupify interface in that it is uncluttered and fairly intuitive. 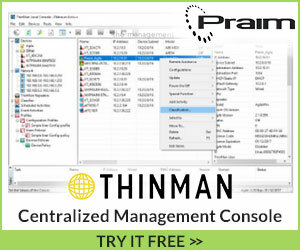 The Spanning UI from a desktop perspective is menu driven from the left side of the browser window. I didn’t run into any issues with any of the Spanning functionality within the interface as everything seemed to “just work”. One thing I noticed is that I had to flag on the licenses for the trial users under the Manage Licenses functionality. The Spanning UI is mobile responsive as you can see below, looking at the OneDrive Screen. 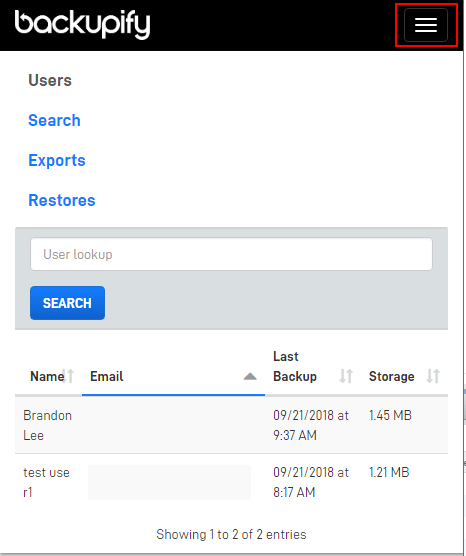 Getting the first backup can be done automatically by waiting on the Spanning backup run or you can perform ad-hoc backups under the users screen and clicking on the user you want to backup. 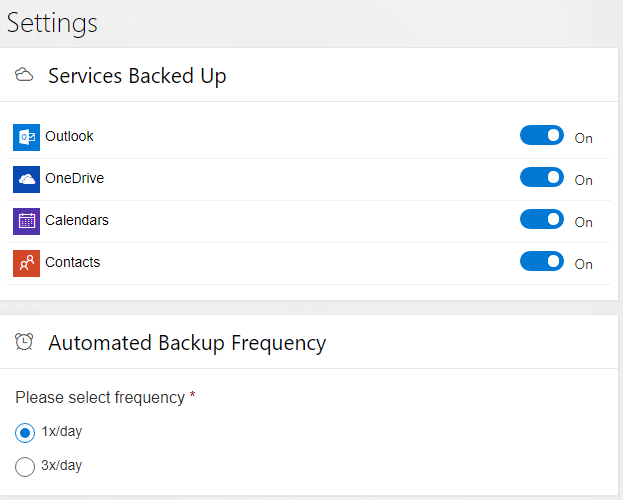 Under the Select Action menu, choose the Backup Up Now option. After performing a backup, you will see the green dot indicators on the services for the user – Mail Calendar, and OneDrive. On the same screen, if you select the View Backups under the Select Action dropdown you can perform a restore. I think the flow of the interface here might be a little confusing on where you initiate the restore from. Choose the service you want to restore. Note how you can Search for specific items. Select the item and choose Restore. 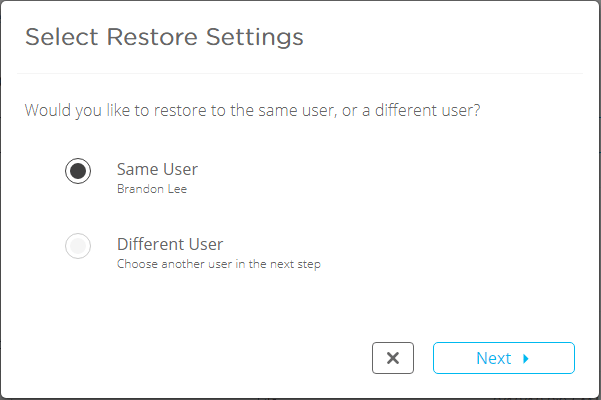 Once you choose to restore, you can select the Same User or Different User. Spanning contains Activity logging that allows auditing actions that are performed and have been performed in the environment which allows seeing all user prompted activities which is a nice feature. One point to note with Spanning, I did not find a way to change the retention policy for any of the applications. When you visit the Settings screen in Spanning, you see the indication concerning retention that you need to contact support(at)spanning.com to change this setting. I am assuming this is not a Trial version artifact, however, that could be at play. Spinbackup has made waves in the world of G Suite environments as a data loss protection solution which is similar to both Backupify and Spanning. 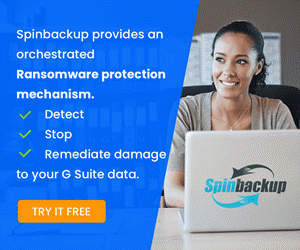 However, in the G Suite marketplace, Spinbackup differentiates itself from the other two solutions by adding additional data leak protection features and cybersecurity capabilities on top of the data protection features contained in the solution. 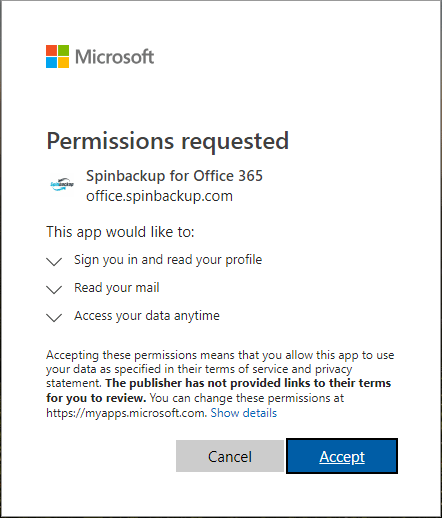 Now, Spinbackup is bringing its solution to Office 365 environments. 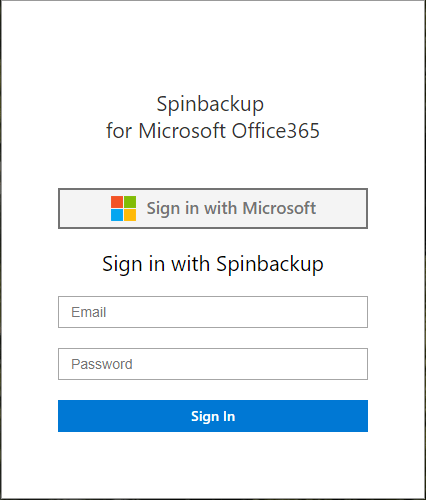 Spinbackup’s solution is available currently in Beta form for Office 365. 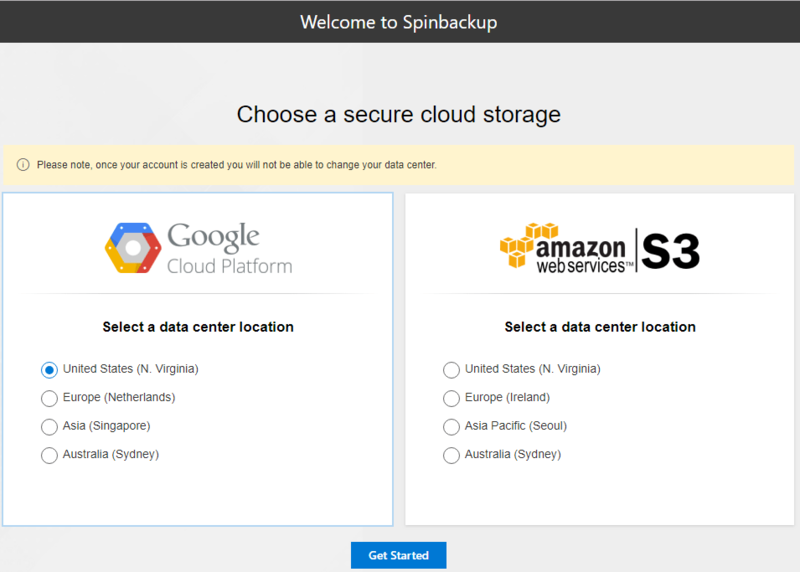 Spinbackup also provides much more powerful features for organizations who want to control where their data is stored and in which public cloud provider data is stored. Spinbackup Office 365 Beta provides the following features and capabilities. Search – Easily search for backed up items for searching for items to recover. 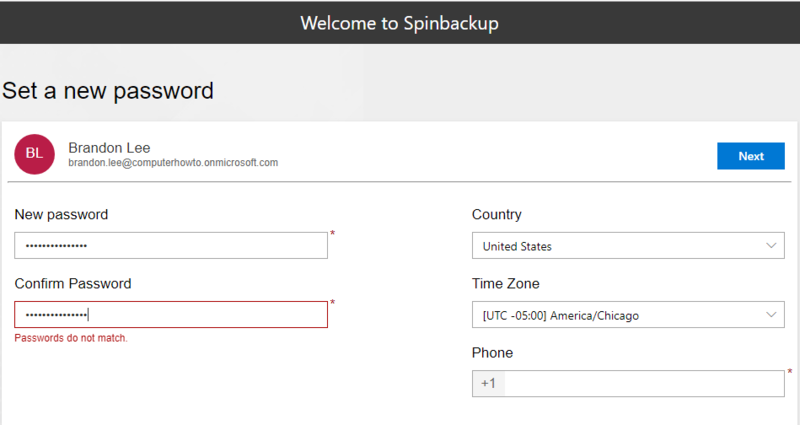 On par with Backupify and Spanning, the steps involved to get Spinbackup up and running is very similar You need to connect the Spinbackup service to the Office 365 environment. Choose to Sign in with Microsoft. 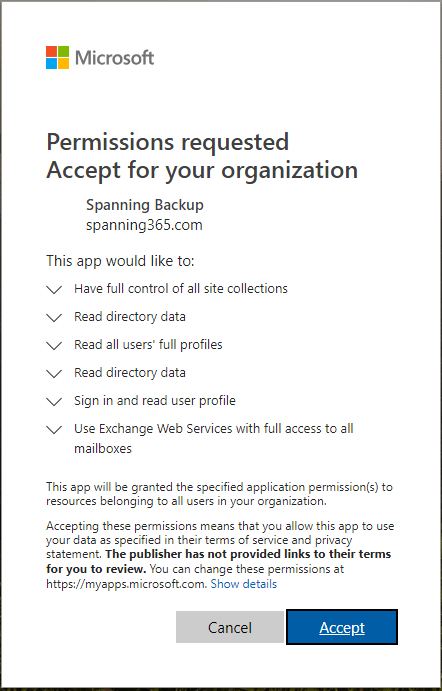 Grant the requested permissions to the Spinbackup application. After select the storage public cloud vendor and location, setup the password for the Spinbackup account along with normal personalization information including time zone, etc. After configuring your password and accepting permissions, the Spinbackup environment is fully configured. Out of the three solutions tested, I have to say the Spinbackup solution UI is by far the best out of the three. Spinbackup’s solution maintains the look and feel of your Office 365 environment. The Spinbackup Dashboard which is displayed by default provides all the relevant information at a glance that you want to see including the amount of data backed up, the protected users, and the backup activity in the last few days. As you can see the interface fits the Office 365 look and feel with very fluid design and intuitive layout. The Spinbackup interface is mobile responsive as well making mobile management a breeze. From the left hand menu, the menu explodes to reveal the available options and Office 365 applications protected in the Spinbackup application. Additionally, you can manage users, see activity, and configure global settings. Under the Settings menu, Spinbackup provides a tremendous amount of configurability here. You can select the services backed up globally by flipping the switch on or off. Additionally, something that Spinbackup offers the other two do not is the ability to customize the backup frequency. You can choose either 1X or 3X daily. You can also choose the default permissions for the Spinbackup application for both Users and Administrators. For the Retention Policy, you can choose how long you want to store the backed up data. The default setting is Indefinitely. You can specify a number of months as well. When you choose to restore files, you visit the appropriate application inside the Spinbackup menu such as OneDrive. 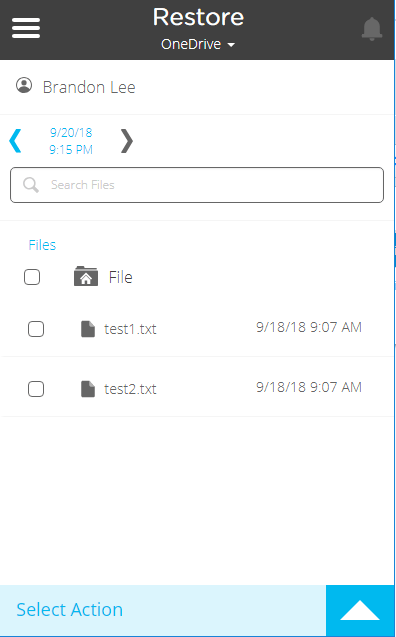 You will see the files listed in the selected snapshot. Note the snapshot is the date displayed next to the Backup and Restore buttons. If you simply click the Restore button, it will restore the entire snapshot of files. However, you can click and choose items individually as well. Spinbackup also allows you to perform cross-user restores which makes migrations extremely easy. If you click the date, it will bring up the Versions configuration that allows choosing the version of the file you want to restore. Lost & Found allows restoring deleted items as well. The Spinbackup interface makes all of the operations extremely intuitive and easy. Files are restored as expected with the restore operation. Spinbackup also include a great Activity section that provides both a summary and list of tasks that have been executed for auditing purposes. The Spinbackup solution is extremely easy and intuitive to work with. The UI interface with the Spinbackup offering is as mentioned earlier IMHO is a better interface than the other solutions tested. The look and feel matches what you expect from Office 365 and all operations are point and click intuitive. The options that you are allowed to configure with Spinbackup in the global settings provide more granular control in permissions, services backed up, backup frequency and also allows retention configuration. Additionally, in thinking about controlling where your data lives and in which provider, Spinbackup is the only solution tested that allows choosing a particular public cloud vendor and specific datacenter. In thinking about protecting public cloud environments today such as Office 365, organizations must think about both data protection AND cybersecurity. When choosing a solution that allows meeting both data protection and cybersecurity objectives in the public cloud, Spinbackup stands out as the solution that does that. My takeaway for readers is this – whichever solution you choose, do yourself a favor and do choose a solution to backup your data! Backups are necessary for making sure your data is protected, even in public cloud environments. 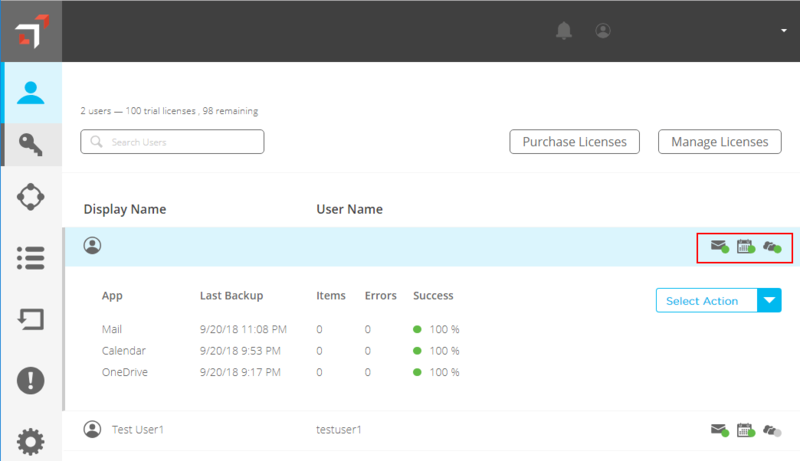 While Backupify and Spanning both did a great job backing up and restoring data, for me, Spinbackup offers the best solution for backing up an Office 365 environment based on functionality, features, ease of operations, and price. The ability to control where your data is stored and in which public cloud vendor is a major advantage that Spinbackup is offering over competitors. By choosing Spinbackup to protect their Office 365 environment, organizations are able to choose which public cloud vendor stores their data and where. This allows businesses to have a consistent and homogenous public cloud strategy if they are already aligned with a specific public cloud vendor. There is no question that Spinbackup will be adding additional data leak and cybersecurity features to the Office 365 product which will only strengthen their offering in the Office 365 space. Spinbackup’s solution offers tremendous value, features, functionality, cloud data choices, and options that outpace the competition.